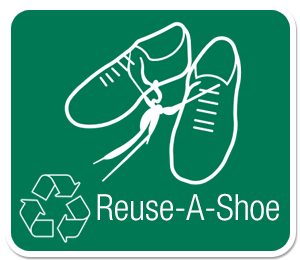 SWALCO Shoe Recycling Project – Reuse Those Shoes! Every year, across the globe, millions of pairs of shoes end up in landfills or disposed of in some other way creating a lot of waste. It is estimated that 85% or more of these unwanted items end up in our landfills, which here in the U.S. and around the world, are filling up fast. No matter what age we are, most of us have at least a few pairs of shoes or more, hanging out in our closets. Some may be shoes we just don’t ever wear, shoes we have outgrown, or those that have gotten a little worn around the edges. For the last decade, and with the pursuit of sustainability in mind, SWALCO has offered a program for groups to collect athletic and other shoes to be recycled or repurposed. Over this time, many tons of shoes have been collected through this program and these tons have all been recycled or reused. Libraries, schools, Scout troops, park districts, City and Village Departments and administration, as well as corporate groups and other organizations have all participated. The City of Zion collects shoes year-round and has participated in this fun and worthwhile program since 2009. All types of shoes can be brought in, with the exception of: rollerblades, ice skates and winter boots. All other boots, like dress boots, hiking boots and rain boots are accepted. Any brand and any size will be accepted. 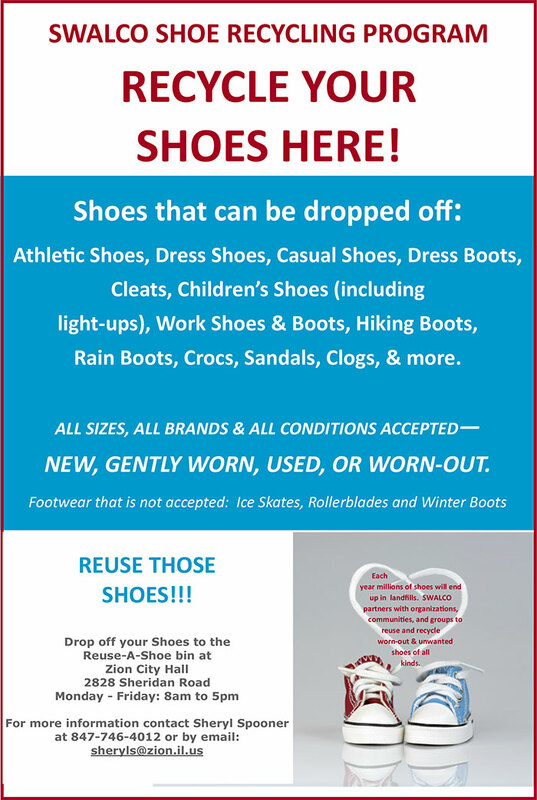 Our collection box is located at Zion City Hall, 2828 Sheridan Road and shoes can be dropped off during operating/business hours M-F, 8 am – 5 pm. Please tie laces or rubber band your pairs together before you drop them off. Shoes in any condition, from new or gently used, to those that are worn, will be accepted. Even those with stains or holes will be accepted. And, the great news is that 95% or more of all the materials collected will be recycled or reused and not only that – you can be a part of this great effort! Make a difference in your community that reaches so much further beyond, and Reuse Those Shoes!